I can hardly believe it but I am really coming to the end of printing these images for Ralph Kiggell’s The Third Thing. My printing office is cruelly cold during the winter but deliciously cool in summer. Added to that I was printing the final, ‘black’ (actually a very dark green) block on this wonderful image – which happens to be very ‘close to home’. When Ralph was staying with us last year, we showed him the place where we had seen our own otters on the icefloes on Christmas day. 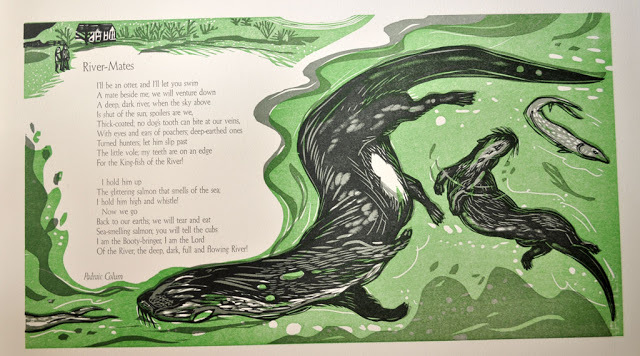 He made some sketches and the next we knew was that he had placed this wonderful otter image at Catchmays Court. Anyway, that is Frances and me up there at top left! I'm looking forward to seeing the lord and lady of the river in all their guises soon!